Indian mythology often brings us stories that are not only educative, but are also relevant through time, in each and every era. Such is the tale of Bhishma Pitamah, the Grand Old Man of the epic Mahabharata. His life is a veritable example of selfless service, loyalty and paropakara (sacrificing his own life for others' benefit). One of the most central characters of Jaya (Mahabharata), his legend tells us about his immense wisdom and teaches us how we should follow the path of the Dharma in our own lives, irrespective of all the wrong and injustice we may have to face during our personal journey. Let us now examine the life of this powerful character, Bhishma. In the Mahabharata, Bhishma was the eighth son of the Kuru King Shantanu and Mother Goddess Ganga. Well known for his Bhishma Pratigya or pledge of lifelong celibacy, he was one of the very few characters in Indian mythology to be blessed with icchamrityu or the ability to decide his time of death at will. An unparalleled archer and warrior of his time, his strength was considered to be equal to that of 4 maharathi warriors. So devoted was he to Lord Vishnu, that he handed down the Vishnu Sahasranama (1000 names of Vishnu) to Yudhishthira even when he was spending his last days on his Sharashaiya (bed of arrows), during the Great Battle of Kurukshetra. The word "Bhishma" in Sanskrit means the "One who undertakes a terrible vow and also fulfills it". Bhishma was famous for his Bhishma Pratigya or vow of remaining a celibate lifelong. 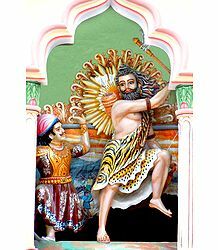 His other names include Devavrata, Gangaputra (Son of Ganga), Shnatanava (Descendant of Shantanu), Mahamahima (the Great of the Greats), Pitamaha (the Grand Old Man; also Grandfather), Gauranga (the One with the Fair Skin Tone), Shwetaveera (the Fair-Skinned Warrior) and Ashtavasu (an Elemental God – in a previous life). The tale of Bhishma's birth is an interesting one. Once, the eight Vasus (Ashtavasus) visited sage Vasishtha's ashrama, accompanied by their wives. One of the wives took a fancy to Kamadhenu, the wish-fulfilling cow, which was residing at the ashrama premises. Knowing that the sage would never give away the cow, she asked her husband, Prabhasa, to steal it from Vasishtha. 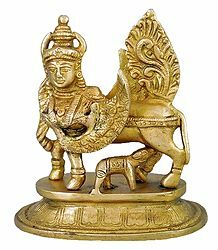 Prabhasa, with the help of the others, managed to steal the cow. When Vasishtha came to know of this, he cursed all the Vasus that they would be born on Earth in human form and would suffer the ill-effects of Karma for the wrong that they had done. When the other seven Vasus, who had assisted Prabhasa in stealing the cow, appealed to Vasishtha for mercy, the sage mitigated the curse, saying that they would be liberated from their human birth as soon as they were born. Prabhasa, though, would have to endure a longer life on Earth, since he was the main thief. Vasishtha, however, softened his curse as well. He told him that Prabhasa would go on to become one of the most illustrious men of his time. The latter was born as Bhishma. Brihaspati, the son of Angirasa; also the teacher of the Devas; taught the boy the rules of Dandaneeti (the duties of a King). He also trained him in political science and other Shastras. Shukracharya, the son of Bhrigu and the mentor of the Asuras, educated Devavrata in political science and other branches of knowledge. Vasishtha, the Brahmarishi and the son of Bhrigu, taught him the Vedangas and other holy scriptures. Sanathkumara, the eldest son of Lord Brahma, shared his knowledge of the mental and spiritual sciences, also called the Anvikshiki. Markandeya, the Immortal One and the son of Mrikandu, taught him the duties of a true Brahmana. Parashurama, the son of Jamadagni, trained Bhishma in the art of warfare. Devavrata was called Bhishma ever since he took his terrible oath of lifelong celibacy. His pratigya (vow) also included the promise to selflessly and loyally serve whoever succeeded the throne of his father (the throne of Hastinapura). His father, Shantanu, fell in love with a fisherwoman, Satyavati, and wanted to marry her. Satyavati too liked him a lot. However, her father refused to give his daughter's hand in marriage, citing the reason that her sons would never become the rulers of the land. This made Shantanu very sad and depressed. 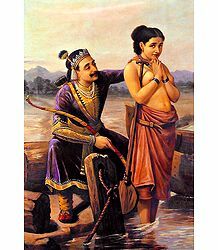 When Devavrata came to know the cause of his father's sadness, he immediately visited Satyavati's father and promised him that he would never ever stake claim on Hastinapura's throne. He also promised him that the child born to Satyavati and Shantanu would go on to rule the kingdom after his father's time. At this, Satyavati's father argued that even if Devavrata would never ascend the throne, his children could still claim the position someday. It was then that Devavrata took the vow of celibacy, thus sacrificing his own position of Yuvaraja (crown prince) and also denying himself the joys of holy matrimony and creating a family. This terrible pratigya immediately gave him the recognition of the Gods. Pleased with his strength and selflessness, they granted him the boon of icchamrityu (the ability to decide his own time of death). This meant that, till Bhishma desired, no one could ever kill him. After this incident, Shantanu had to face severe criticism from his subjects. They were very upset that the king had denied his own son the position of Yuvaraja. They were also worried about the nobility of Shantanu's unborn children – after all, they would be the children of a mere fisherwoman and hence, would never have that royal aura. Hearing this, Bhishma told them that his father was not to be blamed, as he had not promised anything to Satyavati's father. The prime minister of the kingdom then wanted to know who would assume responsibility in case the future crown prince was not capable enough. Bhishma then took another vow that he would always see his father's image in whoever ascended the throne and would serve him faithfully for as long as he lived. Years later, Bhishma was trying to find a bride for his half-brother, king Vichitravirya. He abducted princesses Amba, Ambika and Ambalika of Kashi, from their swayamvara ceremony (a ceremony where princesses are allowed to choose their own spouse from the assemblage of potential suitors present there). Amba, the oldest of the princesses, was already in love with Salwa, the ruler of Saubala. The young king tried his best to stop the abduction, but was no match for the powerful Bhishma. Upon reaching Hastinapura, Amba confided in Bhishma that she and Salwa were deeply in love with each other and they planned to wed each other very soon. Taking pity on her, he sent her back to Salwa, who, bitter from his humiliation at the hands of Bhishma, refused to accept Amba back into his life. Amba then approached Bhishma and begged him to marry her. He refused, citing the reason that he had taken a vow of lifelong celibacy. Enraged at being disgraced thus, Amba vowed to avenge this insult, even if it meant having to be reborn again and again. Amba left Hastinapura and sought refuge with Parashurama, who ordered Bhishma to wed Amba. The latter refused to accept the order, saying he would much rather give up his life than break his pratigya. An angry Parashurama called him for a fight at Kurukshetra. At the battleground, Bhishma realized that he was on a chariot and Parashurama was on foot. He requested the latter to also take a chariot and armor, so that neither would have an unfair advantage. Parashurama then blessed him with divine vision and asked him to look again. This time, Bhishma could clearly see the whole of the Earth as his Guru's chariot. The four Vedas became the Lord's horses and the Upanishads were the reins. Lord Vayu (the Wind God) was his charioteer and the Vedic Goddesses, Gayatri, Savitri and Saraswati became his armor. Humbled, Bhishma got down from his own chariot and fell at Parashurama's feet. He also sought his blessings to protect his dharma, along with the permission to fight his own beloved Guru. Pleased with his student's devotion towards him, Parashurama blessed him and advised him to protect his own vow. The Lord, however, had given his word to Amba that he would fight Bhishma and hence, they fought for 23 whole days. The battle went on and on without conclusion, as each was too powerful to be defeated by the other. In another version, on the 23rd day of battle, Bhishma tried to use the Praswapastra against his Guru. The use of this weapon, which could induce deep sleep, was not known to Parashurama. This could have worked to Bhishma's advantage. However, before he could release it, an akashavani (voice from the sky) warned him that if he used it, it would be a great, unforgivable insult towards his own Guru. His Pitrus (ancestors) then appeared before him and blocked his access to Parashurama's chariot, thereby preventing him from using the weapon against the latter. Then, Narada himself appeared before Parashurama and begged of him to end the battle. The latter agreed and the Gods jointly decided to declare the war a draw. After the battle, Parashurama narrated the events to Amba, also asking her to let go of her anger and seek Bhishma's blessings. She, however, refused to pay heed to his advice and stubbornly declared that she would achieve her objective of avenging herself. She then undertook severe penance to appease Lord Shiva. Pleased, the Lord appeared before her and told her that, in her subsequent birth, she would be born as a man named Shikhandi. Shiva additionally assured her that she would recall her past and would eventually be instrumental in causing Bhishma's death, thus fulfilling her vow. In the great war of Kurukshetra, Bhishma, true to his word, was on the side of the Kauravas. He was the supreme commander of the Kaurava forces for ten days. Though he knew he was not being on the side of dharma, he was duty-bound to support the ruling party of Hastinapura. One of the greatest and most valiant warriors of his time, he had acquired the quality of invincibility from his mother Ganga as well as from his many powerful Gurus. In spite of being about five generations old, the Grand Old Man fought on tirelessly, slaying at least 10,000 soldiers and about 1,000 rathas. Right at the beginning of the war, he had vowed not to kill any of the Pandavas, as he, their grand-uncle, loved them dearly. He also knew very well that they were on the side of truth and righteousness. He also had a great deal of respect for Krishna and knew that the Lord would eventually lead the Pandavas to victory. Duryodhana, the eldest Kaurava prince, often accused Bhishma of secretly supporting the Pandavas. He complained that the Pitamaha was never really fighting for the Kauravas, as he never ever harmed their cousins. What he did not know was that Bhishma equally loved the Kauravas, who too were his grand-nephews and vowed that, as long as possible, he would let no harm to them either. He deeply loved each of the members of his family and desperately hoped that they would all somehow enter a peace negotiation. One night during the war, Duryodhana again approached Bhishma and accused him of being partial towards the Pandavas. This enraged the latter, who vowed that either he would kill Arjuna on the battlefield or make Krishna break his promise of not being involved in the war. Before the beginning of the war, Krishna had clearly mentioned that he was acting merely as a mediator between both the sides, and was hoping for a peaceful settlement. He had promised both the parties that he would not personally lift up any weapon or fight anyone. On the very next day, there was an intense battle between Bhishma and Arjuna. Though the latter was a powerful warrior, he was no match for his much older, much more formidable, grand-uncle. He shot arrows in rapid succession. They tore Arjuna's armor and also broke his Gandiva bow's string. Arjuna just stood there, watching helplessly, as Bhishma was practically unstoppable. As Bhishma came close to killing Arjuna with his arrows, Krishna jumped out of the chariot, lifted a wheel and threatened him with it. Horrified, Arjuna stopped him and begged him not to kill Bhishma and convinced him to return to the chariot. Thus, Bhishma succeeding in almost provoking Krishna to break his vow of not fighting in the war. Several days into the war, the situation still seemed to continue in a stalemate situation, with neither party gaining the upper hand. As the Pandavas started wondering what to do, Krishna advised them to visit Bhishma and request him to suggest a way out of this stalemate. The latter loved the Pandavas and was well aware that he himself was the greatest obstacle in the path to their victory. Realizing that he would have to eliminate himself in order for the dharma to run its course, he gave them a hint as to how they could defeat him. He said that if a woman came before him, he would lay down his weapons and would fight no longer, as he did not consider it gentlemanly to fight or attack a woman. Later, Krishna told Arjuna to involve Shikhandi and ask her to stand in front of Arjuna. Bhishma would then be forced to lay down his weapons in front of her. The Pandavas were initially reluctant to heed this advice, as it would amount to cheating. However, they realized that this was the only way they could win the war. 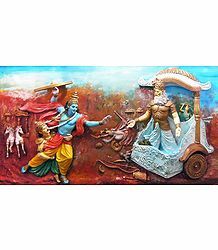 Accordingly, on the next day, which was the tenth day of the Kurukshetra War, Shikhandi accompanied Arjuna on his chariot and challenged Bhishma. True to his word, the latter put down his weapons and was felled by innumerable arrows hurled at him by Arjuna. The arrows pierced Bhishma's entire body, forming a bed (Sharashaiya) as he fell. In this way, Shiva's promise to Amba, that she would be the cause of Bhishma's destruction and death, was fulfilled. Amba got her revenge in this birth as Shikhandi. 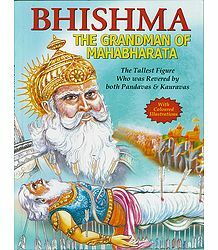 Bhishma's whole body was held above the ground, supported by the shafts of Arjuna's arrows, which pierced and protruded him from his back, right through his arms and legs. Seeing this great personality in such a helpless situation, bleeding profusely from every pore, even the Gods were humbled and silenced in shame at the adharma that had just occurred in the battlefield. They silently showered their blessings on the mighty warrior. When the princes of both the sides as approached him and asked him if they could do anything to help, he told them that, while his body was supported by the arrows, his head hung loose and received no support. The princes rushed to find pillows of silk or velvet. But he refused them, and instead, asked Arjuna to give him a pillow fit for a warrior. The latter then removed three arrows from his quiver and placed them under Bhishma's head, thus offering it the required support. To quench his thirst, Arjuna shot an arrow into the earth and a stream of water sprung up and into the veteran's mouth. It is believed that Mother Ganga herself rose from the earth to quench her son's thirst. Before finally letting go of his mortal coil, while still on his bed of arrows, Bhishma summoned Yudhishthira to give him advice on politics and how to rule a country. The Shanti-Parva in the Srimad Bhagavad Gita is his dialogue with Yudhishthira, the rest of the Pandavas, Draupadi and Lord Krishna. After the war, Yudhishthira was overwhelmed with sadness and remorse at the amount of bloodshed and damage that it had caused to everyone. He wanted to take sannyasa (renunciation) and did not want charge of any kingdom. It was only after much persuasion from his family and Maharishi Veda Vyasa that he even accepted to the coronation ceremony. Even so, Krishna knew that he could end up sacrificing this post at any time. Hence, he asked the eldest Pandava prince to go meet Bhishma and learn the rules of good governance from him. The Pitamaha, having vast knowledge of all things concerned with ruling and governance, talked to Yudhishthira in detail about this subject. This advice gave rise to the Bhishma Neeti. Of all dharmas, Raja-dharma was the highest, as it nourished all the subjects of the land and also comprised all sacrifices. He mentioned that in every age, Kshatra-dharma (the warrior dharma) had to be kept active, as it represented the greatest sacrifice of a king, who was willing to lay down his life for his country. The main duty of the king was to serve his subjects and not merely to administrate or collect taxes. His prime aim would be to keep his subjects happy and protect them from poverty, death and disease. That would ultimately lead the way to the king's own salvation. The law of taxation, he explained, was simple. There was no force or encroachment. The tax amount was not meant to be squandered away – it was to be used to strengthen the reserve fund. The king had the right to take only one-fourth of the amount received – no more. He would have to be pure of mind and use this wealth only to help enhance the peace and prosperity of the land he ruled. The king would have to select his cabinet ministers wisely. For this, he would have to consider not merely the number of votes, but also decide if they will actually carry out their duties in a righteous way, keeping in mind the prosperity of the country. Lastly and most importantly, the king would have to be pious, devoted and religious. He would have to work to please the Lord. He should pray every day and perform regular poojas, listen to the Shrimad-Bhagavatam and also selflessly serve other devotees. After the war, still laying on his sharashaiya, Bhishma gave detailed instructions to Yudhishthira, the eldest Pandava prince, on the duties of a king, his dharma and the rules of statesmanship. He told the latter that, though he knew that he was being adharmic, he simply had to be on the side of the Kauravas, as he was duty-bound. He then advised the young prince to always follow the path of righteousness, no matter what consequences he may have to face for it. Finally, the great warrior decided that he no longer wanted to fight. Focusing all his energies on channeling his thoughts toward the Divine Being, he decided that he now wanted to leave this mortal world. He lay there for about 58 nights, waiting for the most auspicious moment to shed his mortal coil. Why Did Bhishma Wait So Long to Attain Samadhi? There are two upper worlds knows as "pitru yana" and "deva yana". After leaving the mortal body, the jeevatma (individual soul) goes to either of their worlds. Of these two, the deva yana leads to the world of Brahman, from where the soul has no rebirth and hence, does not return to earth. The pitru yana, on the other hand, leads to the Chandra Loka, from where the soul has to enter yet another body and return to earth as a rebirth. During the Uttarayana (or the winter solstice), the sun ascends the northern path in the sky. This opens the path of deva yana. On the first day of Uttarayana, Bhishma gave up his mortal body, while still on his sharashaiya. So blessed was he that he instantly attained moksha or salvation. He was granted entry into the Maatru Loka, which is believed to be even higher than Vaikuntha, the residence of Lord Vishnu himself. The Shukla Ashtami (8th Tithi or lunar day) of the Magha month marks the death anniversary of Bhishma Pitamaha. This day, hence, is also known as Bhishma Ashtami. Many devout Hindus observe the Ekodishta Shraardha for him on this day. Normally, a shraardha can be performed only by those people whose fathers are not alive. However, many Hindus communities disregard this tenet with respect to Bhishma and perform this shraardha irrespective of their father being dead or alive. Such is the greatness of the Pitamaha of the Mahabharata. They perform a "tarpan" on the banks of a river. First, they take a dip in the holy waters and then offer a mixture of sesame seeds and boiled rice to Bhishma and all their ancestors. They offer this mixture to Mother Ganga, praying that she blesses them and absolves them of their sins and negativity. Several devotees additionally observe fast on this day and take the sankalp (mental vow) to offer the "Arghyam" to the great soul and chant the Bhishma Ashtami Mantra. In fact, several texts prescribe that every Brahmin should necessarily offer respects to the Great Pitamaha Bhishma on this day. Starting from the Bhishma Ashtami day, Bhishma Panchaka Vrata (fast) is observed in all Vishnu temples for five whole days, till the Bhishma Dwadasi. Followers believe that, if they observe all rituals with complete devotion, they will beget a son as strong, powerful and steadfast as Bhishma. Bhishma Pitamaha was the one who gave the Sri Vishnu Sahasranama (1000 names of Vishnu) to the world. This day falls on the 11th day of the waxing moon, in the month of Magha, according to the lunar calendar. This Shukla Paksha Ekadasi day comes exactly 2 months after Krishna gave Arjuna the Gitopadesha, while on the battlefield during the Kurukshetra War. This day, also referred to as Bhishma Ekadasi, was the day when the Pitamaha recited the greatest ever stotra (hymn), the Vishnu Sahasranama. He revealed this powerful stotra to the Pandavas, when he was still lying on his sharashaiya. Krishna was well aware that Bhishma was the best person to talk about the ultimate truth to the Pandavas. Hence he requested the Pitamaha to enlighten the princes about dharma and the Ultimate Truth. The Lord also relieved the stalwart of his pain, so that he could unhindered and uninterrupted. The Vishnu Sahasranama is actually the sum of the very essence of the Bhagavad Gita and all the Vedas put together. Since this was uttered by the greatest Acharya of all times; the one chosen by the Lord himself; this is considered to be most sacred. This hymn is beautiful, poetic and melodic and acts as a shield against all evils and obstacles; thereby offering the devotee peace of mind and protection from all forms of negativity. Chanting it or even listening to it regularly and with a pure, pious mind can grant the devotee liberation from this samsara sagara (material world). Bhishma is considered to be the greatest example of loyalty, devotion and sacrifice. One of the greatest ever Brahmacharis of all time, he was filled with tremendous Ojas (aura) due to his strong will and his pratigya. He was a true Kshatriya (warrior), yet remained a peaceful ascetic at heart. He never displayed unnecessary anger or passion and always stood by his word. He was also highly skilled in political science and possessed all the qualities to become an excellent ruler. The goodness of his heart and his love for Krishna made him one of the greatest devotees of the Lord himself. He tried his best to prevent the war and wanted both sides to reach reconciliation. Even during the war, he tried to keep the confrontation between the Pandavas and the Kauravas to the minimum possible level. Considering all his great qualities, he was a complete warrior, a complete human being and a complete teacher (acharya) as well. Hence, he is also known as Bhishmacharya. Unfortunately, the only rewards he received for all his qualities were loneliness, frustration, suffering and sadness. However, that was his karma and he was but bound to endure all that during his mortal time on earth. He rashly kidnapped the princesses of Kashi against their will and that resulted in one of them (Amba) losing her love and her life. Though he wielded great influence over Duryodhana, he never once corrected him from his wicked ways. He was well aware about the fact that Karna was actually Kunti's first son, who she had abandoned, for the fear of being branded an unwed mother. Revealing that fact to the Pandavas could have eased much tension between them and Karna. However, he maintained silence on the issue and never let them know that they were his brothers. He also failed to protect Draupadi; the wife of the Pandavas; and did nothing to prevent her from being humiliated and disrobed in front of an entire court comprising great warriors, scholars and erudite gentlemen. This was most unforgivable, as he had kept quiet when the modesty of the Putravadhu (daughter-in-law) of the family was being cruelly outraged in public. Ever since the first silent film in 1922, Bhishma's life has been portrayed via films in several different Indian languages, including Hindi, Bengali, Telugu, Tamil and more. The popular television series, Mahabharata, directed by B.R.Chopra, did complete justice to the Pitamaha. The character was ably played by the versatile actor, Mukesh Khanna. More TV serials and films continued to be made on the subject. One question that often comes to mind is, "why were the arrows piercing Bhishma's body not removed? Why did he accept to suffer this painful fate?". There is a reason for this. According to the Mahabharata, Bhoomi Devi (Mother Earth) did not accept him back, as he had lived too long a life. The normal lifespan of a person in that era would have been two generations. However, the grandsire had lived on for over four generations. As if it was not bad enough that Bhoomi Devi would not accept him; the Akasha (sky) refused to take him in as well. Bhishma had chosen to remain single lifelong. He had not married and had not fathered children. Due to this, he had not repaid his debt to his ancestors. Hence, Akasha too did not want him. Bhishma told Arjuna about his plight and begged him for mercy, asking him to do something, which would see that he neither belonged to the earth, nor to the sky. That is why Arjuna was forced to shoot arrows at his Pitamaha in such a way that he would be suspended between the ground and the sky. We often wish for a good death; as regards both our time of death and the way we pass on from this world. Being mentally, physically and financially independent at the time of death is very important to us. Going quickly would also save family and loved ones from the constant mental trauma or seeing their people suffer and reach a painfully slow death. People would also like to complete certain tasks before leaving this mortal world. The elders in the family, for example, would like to see their young ones settling in life or begetting children/grand children before they permanently close their eyes. Then, according to Hindu belief, dying during certain auspicious days or in certain months when the sun is transiting from south to north is considered to be auspicious. This type of death also acts as a sort of solace to the survivors in the family. In the case of Bhishma, he had the boon of icchamrityu. He could live as long as he pleased and die only when he truly wished for it. Of course, this is similar to the modern-day concept of euthanasia, which is at present a hot subject of debate in India. What is euthanasia and should it be legalized in India? Euthanasia, which implies ending life intentionally, can be voluntary, non-voluntary, active and passive. In 2011, the Supreme Court made a landmark judgment by legalizing passive euthanasia, under certain conditions. While proper laws are being created on it, there is another concept now, called the "living will". This permits people to predetermine the type of treatment that they should receive, should they suffer from an incurable disease in the future. After this judgment, relatives of a patient can seek passive euthanasia if the latter is in an irreversible coma or is brain-dead and cannot carry on without constant life support. The court, in this case, will study the person's medical reports and then come to a conclusion. Some NGOs such as the Common Cause are trying to persuade the government to consider the concept of the "living will". However, the government is against it, as it feels that this power could be gravely misused in the wrong hands. While Article 21 of the Constitution of India grants citizens the right to reject treatment and the right to die peacefully (just as Bhishma did), the issue in today's time is very sensitive, as the elderly are often harmed or mistreated for greed. Hence, the need of the hour is to enforce far stricter conditions to check the erroneous use of living wills. At present, the subject of euthanasia in India still stands as a question mark, with no immediate solution in sight. What do you think about the issue? Should people have the right to icchamrityu like Bhishma did? Should euthanasia be legalized in India? 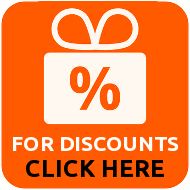 We would love to hear your opinions.